Designed for super cold, frigid conditions. The life of a mitt is not easy. More than any other part of your riding kit, mitts have the most contact with the elements. 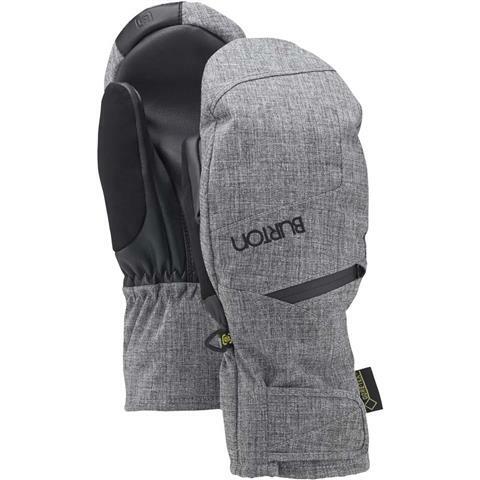 With that in mind, the Burton team chooses the bestselling women’s Burton GORE-TEX® Under Mitt + Gore warm technology. DRYRIDE Durashell™ 2L fabric, and a GUARANTEED TO KEEP YOU DRY® GORE-TEX® membrane protect this Thermacore™ insulated mitt from burly conditions. Screen Grab® synthetic leather gives you full coverage touchscreen control using tech that will never fray, wear out, or wash off. A removable four-way stretch fleece liner dries quickly and gives you options for any weather. Wear just the liner when shoveling, just the shell in sloppy spring conditions, or combine the two for total midwinter warmth and comfort. Durable, warm, comfortable glove for all conditions.